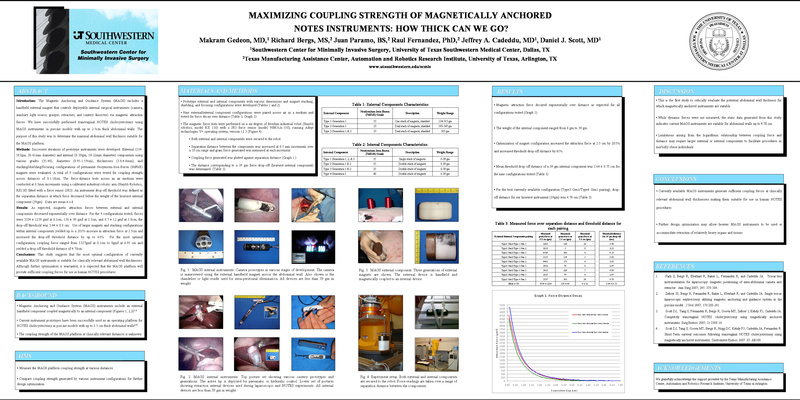 Maximizing Coupling Strength of Magnetically Anchored NOTES Instruments: How Thick Can We Go? Introduction: The Magnetic Anchoring and Guidance System (MAGS) includes a handheld external magnet that controls deployable internal surgical instruments (camera, auxiliary light source, grasper, retractors, and cautery dissector) via magnetic attraction forces. We have successfully performed transvaginal NOTES cholecystectomy using MAGS instruments in porcine models with up to 2.5cm thick abdominal walls. The purpose of this study was to determine the maximal abdominal wall thickness suitable for the MAGS platform. Methods: Successive iterations of prototype instruments were developed. External (134-583gm, 38-61mm diameter) and internal (8-39gm, 10-22mm diameter) components using various grades (35-40), diameters (0.95-1.59cm), thicknesses (3.0-4.6mm), and stacking/shielding/focusing configurations of permanent Neoymium-Iron-Boron (NdFeB) magnets were evaluated. A total of 9 configurations were tested for coupling strength across distances of 0.1-10cm. The force-distance tests across an air medium were conducted at 0.5mm increments using a calibrated industrial robotic arm (Staubli Robotics, RX130) fitted with a force sensor (JR3). An instrument drop-off threshold was defined as the separation distance at which force decreased below the weight of the heaviest internal component (39gm). Data are mean ± s.d. Results: As expected, magnetic attraction forces between external and internal components decreased exponentially over distance. For the 9 configurations tested, forces were 3334 ± 1239 gmf at 0.1cm, 158 ± 98 gmf at 2.5cm, and 8.7 ± 12 gmf at 5.0cm; the drop-off threshold was 3.64 ± 0.8 cm. Use of larger magnets and stacking configurations within internal components yielded up to a 281% increase in attraction force at 2.5cm and increased the drop-off threshold distance by up to 61%. For the most optimal configuration, coupling force ranged from 5337gmf at 0.1cm to 0gmf at 6.95 cm and yielded a drop-off threshold distance of 4.78cm. Conclusions: This study suggests that the most optimal configuration of currently available MAGS instruments is suitable for clinically relevant abdominal wall thicknesses. Although further optimization is warranted, it is expected that the MAGS platform will provide sufficient coupling forces for use in human NOTES procedures.